We are a small, dedicated, friendly team of professionals who will advise and help you and your furry friend through training, making it a fun and enjoyable experience for all. Our dog school is located in the village of Hildersham near Linton, Cambridge. We run classes on Monday’s and Thursday’s from 6pm – 9.30pm. We offer various courses designed to meet the specific requirements of both you and your puppy. Classes are kept to small numbers (usually 6) allowing for more quality time with your trainer. All our training methods are kind, fun and effective. Clicker training is encouraged, but may not suit everyone and is therefore an option. 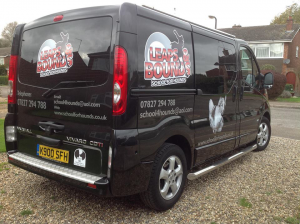 Our aim is to successfully assist all our clients with all aspects of their dog’s training and education. We will advise you on how to develop your relationship with your furry friend by teaching you the skills necessary to train your dog to become an obedient, confident and happy individual. TRAINING YOUR PUPPY SHOULD BE A FUN EXPERIENCE, ENJOYED BY ALL.